The Solaris 100 is a manual loading RTP system for R&D and pre-production. The Solaris 100 can process up to 101.6mm (4″)substrates at a temperature range from RT- 1250 degrees Celsius. The Solaris 100 utilizes 13 quartz halogen lamps on top and bottom of the wafer to reduce non-uniform heating from pattern effects seen on single sided RTA systems. The high-purity quartz wafer holder and chamber is manufactured out of semiconductor grade low OH quartz to eliminate metallic contamination. The oven contains gold reflectors for fast heating rates and long lamp lifetimes. 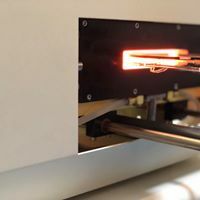 The Solaris 100 is a low cost, small footprint Rapid Thermal Processing system designed for research applications and processing samples up to 101.6mm in diameter. The advanced temperature measurement technique and state of the art signal conditioners allow the PID graphical software controller to maintain stable and repeatable temperatures through a wide process application base. The system is provided with a the latest Pentium PC with Windows compatible software for editing recipes and process data logging. ▪ Excellent repeatability by use of state of the art thermocouple signal conditioning. ▪ User Friendly software that allows users to interact with data including 9 different graphing options. ▪ Gas Delivery system is capable of up to 4 Mass Flow controllers. ▪ Zone control temperature for enhanced process control and allows for top side or bottom side heating only as an option. ▪ Wafer Capability: 1″ to 4″ , Sample holders are available. ▪ Sic Coated Susceptors available for III-V processing wafers up to 76.2mm(3″).